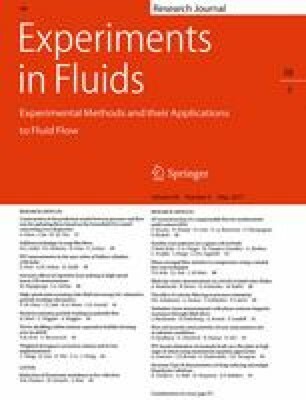 Data assimilation can be used to combine experimental and numerical realizations of the same flow to produce hybrid flow fields. These have the advantages of less noise contamination and higher resolution while simultaneously reproducing the main physical features of the measured flow. This study investigates data assimilation of the mean flow around an idealized airfoil (Re = 13,500) obtained from time-averaged two-dimensional particle image velocimetry (PIV) data. The experimental data, which constitute a low-dimensional representation of the full flow field due to resolution and field-of-view limitations, are incorporated into a simulation governed by the two-dimensional, incompressible Reynolds-averaged Navier–Stokes (RANS) equations with an unknown momentum forcing. This forcing, which corresponds to the divergence of the Reynolds stress tensor, is calculated from a direct-adjoint optimization procedure to match the experimental and numerical mean velocity fields. The simulation is projected onto the low-dimensional subspace of the experiment to calculate the discrepancy and a smoothing procedure is used to recover adjoint solutions on the higher dimensional subspace of the simulation. The study quantifies how well data assimilation can reconstruct the mean flow and the minimum experimental measurements needed by altering the resolution and domain size of the time-averaged PIV. Support from a National Science Foundation Graduate Fellowship (S.S.) is gratefully acknowledged. The authors would also like to thank Professors Tim Colonius and Anthony Leonard for discussions about the direct-adjoint optimization framework as well as Kevin Rosenberg for his assistance in implementing the optimization procedure on a cluster. Finally, the authors wish to thank the referees for their suggestions which improved the clarity of the paper.